Calculate Proper Seal Size - Ultrafab, Inc. 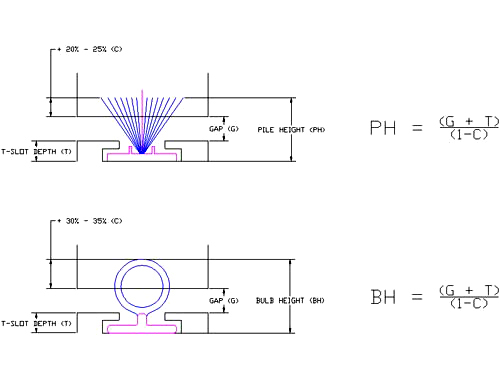 Using these simple equations you can easily and accurately calculate what seal height is optimal for your application. The compression range for each type of seal has been calculated for you using extensive testing comprised of cycling through compression, operational force, and accelerated weathering. This range allows for you to maximize your windows or doors sealing ability along with extending the life of its effectiveness. Ultrafab’s formulas and suggested compression level targets regarding seal sizing and selection are for reference only. All applications vary individually and designers will need to complete their own testing to determine proper seal selection.